From a very young age, I was fascinated with country music. I think it was the first genre of music I really liked. When I was younger, I just loved to sit at my Dad's computer and listen to Mel McDaniels, Alabama and Dixie Chicks (I know that last one is on the pop side of the country genre, but that's kinda my point). I've always loved the dulcet tones, sweet melodies and beautifully honesty lyrical content. There's something about that sound that always gets me in a good way, maybe it's the simplicity of the sound or the way the lyrics can cut through the complicated feelings and ideas of this weird thing we call life. It's always a style of music that manages to stick in my head. It's also the genre I return to in the times of my life where I need a minute and recharge my emotions. Listening to that kind of music as a kid definitely shaped the sort of music that I listened to going forward. Now, I don't need everything song I listen to be a country tune or have the characteristics. Yet, I do find my self-loving music that has that bit more of a personal touch to it. You know? Songs that are genuine, passionate and well-written. The other thing I love about the genre is the lyrical storytelling that is usually displayed. You can really feel an emotional connection to the music and when you hear an artist bare their soul in a song, it's an awesome feeling to make that connection. In terms of production styles, out of the two major styles (Nashville Country and Outlaw Country), I'm a fan of both. Don't get me wrong, I often tend to lean further towards the more rock 'n' roll style of Outlaw country, I still love some good Nashville pop country. I won't lie sometimes all you need in life is bright happy music, telling you that everything will be OK. For me, it's comforting to hear such emotion coupled with simple, yet effective, musicianship. 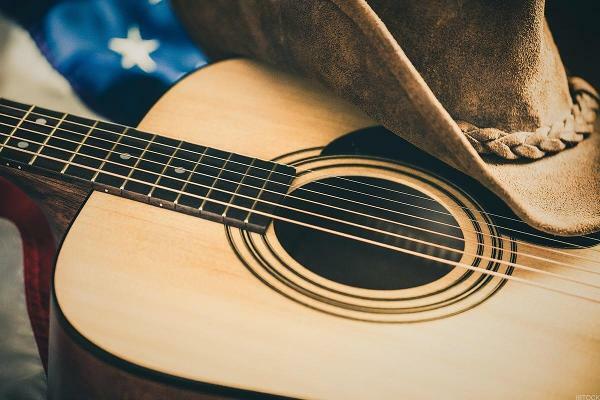 Yes, I love other genres with the same passion, however, country-music has been there since the start for me so it pretty much became my barometer for good music. Also, let's address something else. Yes, I'm British and I feel more of a connection to the music of an entirely different culture more than classic rock, mod rock, brit-pop or heavy metal, you know something more inherently contemporary-British. I know that's not too much of a shock to the generation of 2019, the MP3 and streaming generation, everyone listens to everything by now. So, why am I writing this article? Well, in recent years, I have got back into the genre in a big way. I have started to love the culture more than ever and I become an active member of the country music community. See my review of HRH C.R.O.W.S. weekend for more evidence of that. So, I guess I wanted to pay homage to the style of music that gave me my music taste and inspried me to pick a guitar as well. This is just going to be a few words about the music that I grew up with and that I still love now. So yeah, if you've come this far the, maybe, read on. I guess the first songs I ever really loved were the greatest hits of Alabama. A 1980's country rock band with fantastic songs like "If You're Gonna Play In Texas", "Mountain Music" and "Dixieland Delight". Yeah, I didn't get some of the more adult themed lyrics at the age of seven but I still felt that connection. The sound was still appealing. I loved the twang of the guitar, the fast and loose violin style and the simple drawl of the vocals just sounds so damn appealing to my ear. If you're acquainted with my music taste what-so-ever, then you will know the song, "Lousiana Saturday Night" by Mel McDaniels. Yes, it's my favourite song and I remember having it on repeat again and again throughout my childhood, if you ever speak to my family, I'm sure they would confirm that. The song is really effective with a simple hook, minimalist instrumentation and simple premise, this song is always fun to listen to. On the pop side of country music, I have always appreciated the music of Garth Brooks, Shania Twain and Dixie Chicks. Yeah, I know they have their detractors and you can make fun of me for liking their music if you wish. Yet, I loved their songs as a kid (and still do to an extent). The pop side of country music, otherwise known as "Nashville Country", is certainly easy listening material. There's a lot of fun and engaging songs that fall into this category and you can deep-dive into this genre and find some incredible songs. I will admit that I'm a fan of more modern pop-country. Radio friendly with big and bold hooks that work their way into your head. I'll talk about this later. You know? I've made reference to this in the past but my all time favourite band is one called, Tantric. An alt-rock band with that southern rock edge. As I was getting into hard rock and metal throughout my teenage years, I did break away from country music slightly but keeping up to date with them somehow kept me in this genre and this world. You know by sticking to southern and outlaw rock. As I am apart of the MP3 generation of music, I do listen to a little bit of everything. Yet, there was something that kept me coming back to this style of music. Artists like: Shooter Jennings, Black Stone Cherry, Dan Baird and The Kentucky Headhunters were always so interesting to listen to. I love their tone and their music. The gritty guitars, smooth bass and emotionally powerful lyrics are all so good to here. Also, listening to them encouraged me to seek out the artists that inspired them. So, I built up my library even further. I think that is the sign you're into a genre, you keep digging into other bands and artists that even remotely sound like the ones you currently enjoy. Surprisingly, I also kept up with the pop side of things. Artists like Lady Antebellum, The Band Perry, Little Big Town and (yes shocking, considering her current output) Taylor Swift. Their music is easy to digest pop-country. Yet, I kinda love that about it. When you pick up their records, you're, more often than not, treated to exceptional production and well-crafted songs. I'm also a big fan of the modern torch bears for that amazing Nashville sound, Carrie Underwood, Brad Paisley and Keith Urban. Anytime they release anything, I'm pretty interested to hear it, not everything they've done is great, but a lot of it is. Even as a brooding teenager listening to nu-metal and pop-punk, I still had room in my heart for some good, fun country music. Very recently, I have been getting back into the country world, after spending a good few years only looking at hard rock and metal bands. Seriously, 2013-2016, I was pretty laser-focused on hard-rock and heavy metal, plus all the facets thereof. Not that there's anything wrong with that, if you're just into that sort of thing and nothing else, then more power to you. Yet, I was eager to continue to get back to my music loving roots and dig out some great country music again. In recent years, I've been more than enthralled by artists such as Christopher Shayne, The Outlaw Orchestra, Kacey Musgraves, Boss Caine, The Shires, Izzie Walsh, Matty James Cassidy and of course the excellence of an artist that is Chris Stapleton. Also many more but those names in particular. I have continued to be an active member of the community and I love the tones and sounds that consistently keep to come out. For this is one passion that will never go away. Artists come and go but the sound will always remain. Hell, one of my first ever concerts that I went to was The Eagles in Manchester. When that is one of your first gig experiences, it's something that sticks with you. So, what was my point? Well, one to explain why I have such a connection to this style of music. How it remains within me and has kept me going in the darkest of times. It parties with me when I'm on top and guides me through the sad and low times. It's music that I have a genuine connection with and I wanted to share that with you, in the hopes that I could introduce you to something fun and interesting. Goofy yet oddly profound. If you come away from my blog discovering something that you may genuinely love, then I have accomplished my mission and instead of picking a couple of names, why not highlight a genre that has remained so special to me over all these years. After all, why piss on something I hate when I can shine a light on something I love.